The Film & Broadcast Cloud Platform + Edge Gateway. Your data is under new governance. Meta is the Cloud Computing Platform and API Edge Gateway for the Film, Broadcast & Enterprise Video Service Industries. Powerful tools deliver precise catalog metadata management, secure data cleansing & manipulation, focused analytics, delivery and frictionless API configuration via an always-on web-based user interface that's intuitively designed to be accessible to your whole organisation. • Aggregation, enhancement and delivery of metadata at scale. • Durable, performant and secure data storage & management solution. • Enable continuous discovery & increase consumption, sales & value. • Increase agility & innovation and launch faster. Justice League © 2018 DC Entertainment & Warner Bros. Pictures. Westworld © 2018 Home Box Office, Inc. All Rights Reserved. Gravity © 2013 Heyday Films & Warner Bros. Pictures. Ready Player One © Amblin Entertainment & Warner Bros. Pictures. NBA © 2018 National basketball Association & Turner Broadcasting System, Inc. Rick & Morty © 2017 Harmonious Claptrap & Adult Swim. Rapid growth in non-linear, VoD and OTT platforms has left the technology infrastructure playing catch-up. Legacy systems have been hastily adapted, leading to failures in the process & governance required to maintain accurate & consistent catalogue data & assets. Outdated, ill-suited platforms are obstructing progress, while rigid data management & delivery infrastructure can cause costly errors and delays. "Show me a highly rated western starring Daniel Craig." Voice command is now the driving force in consumer technology - HomePod, Siri, Alexa, Google Home - all require accurate, detailed, specific & contextual metadata, combined with lightning-fast & efficient delivery. This is now the determining factor in how content is accessed & ultimately valued. Meta provides a broad set of specialised infrastructure services to meet these needs through it’s four core components. Setting the Scene. What problems does Meta solve? As the Entertainment Market continues to shift towards OTT, digital delivery and consumption, there are a number of common problems that Studios & Broadcasters need to resolve to respond to these new opportunities. Legacy architecture often requires costly resources to maintain and integrate across your supply chain. This results in high-overheads, slow delivery, and complicated system mapping & deployment. Meta enables you to free data from legacy silos, move to the cloud, clean & standardise your data and easily configure your integrations. Global broadcasters often end up with multiple catalogues across the globe. Without strong governance, identification and matching, this leads to fragmentation and an inability to share Metadata across assets which invariably leads to substantial costly task duplication. Meta enables you to easily consolidate catalogs for efficient data sharing. The recent explosion in cloud API-driven products & services can provide exponential time & cost savings if deployed correctly: Video Intelligence, Adult Content Detection, Transcription, Language Detection, Speech to Text, Segmentation, Reviews & much more. These cutting-edge services & benefits cannot be leveraged or exploited without a modern, connected data platform. Device-wide, cross platform voice command search is driving consumer discovery & growing at an exponential rate. If your programme metadata is not accurate, deep & contextual, your content can get lost in the noise. 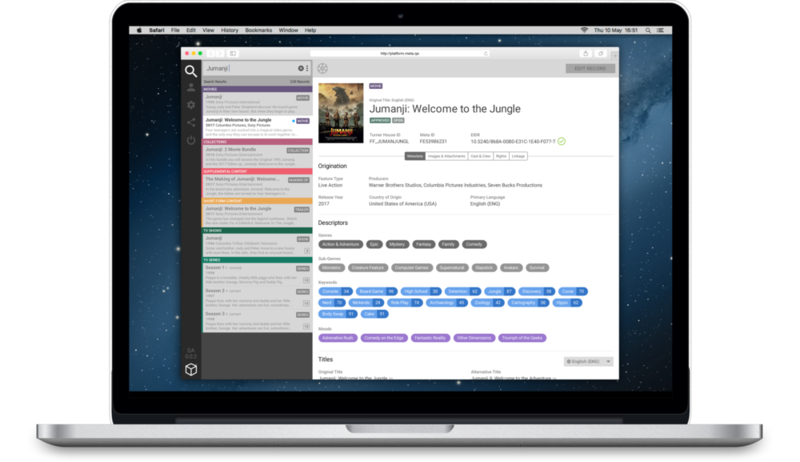 Meta helps your content get found, viewed and monetised in this audio-driven UI / UX environment. After convenience & security, personalised content is third on the list of modern-day consumer requirements for VoD & OTT. With clean, fast & accurate metadata, Meta can help you optimise data-driven content personalisation. "In large companies [without dedicated Metadata Management & Governance] more than 25% of critical data is inaccurate or incomplete. The annual enterprise cost per bad data record is estimated at $100 - average financial impact of poor data on business $9.7M annually. Non-financial costs are: loss of reputation, missed opportunities & higher-risk decision making." "For insurance purposes, the estimated cost of bad data is is 17.5% of net revenue."